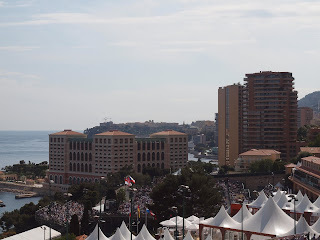 This is the most my camera will see of the Monte Carlo tennis. It's impossible to park in Monaco at the moment with the tennis and also with Top Marques, the car show. I pulled up as I drove out of Monaco at an illegal place, pushed my camera under the bars of a metal barrier and grabbed these shots. Because of the barrier I couldn't get the angle to see the centre court but you can see the spectators watching the match taking place on it. In the smaller photo you see the clubhouse on the right. 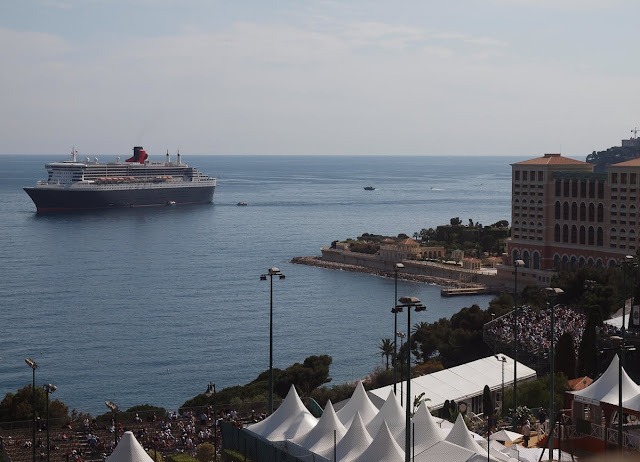 The boat, by the way, is the Queen Mary II. It is indeed a busy place! Never mind the tennis, bring on the cars! Oh what a photographer will do to get a great shot, well done, Jilly.